The Dying Ship is a scenario for use with the Middle East-influenced Science Fiction roleplaying game, Coriolis: The Third Horizon. Originally published in Swedish by Free League Publishing, it has since been published in English by Modiphius Entertainment, and presents a short adventure which can be run in a single good session—perhaps two at most—and which can be run after ‘The Statuette of Zhar’, the short scenario in the back of the core rules. It comes with a pre-generated set of characters for quick play if the players have not created their own (they will need to create a ship of their own), a myth and plot drawn out from the Dark Between the Stars, and a desperate race to find out what has happened to a lost ship. For the most part the Game Master will be mostly reacting to what the players and their characters are doing, but she has access to a number of NPCs as well as certain strange things for the player characters to run into. The sandbox element of the adventure more or less ends when the player characters confront the true threat aboard the ship. Then it switches from a sandbox to a countdown—remember that oncoming, deadly asteroid cloud? Throughout the adventure there is advice for the Game Master, in particular staging advice allowing her to begin The Dying Ship In Media Res followed by a series of flashbacks. Plus there are numerous suggestions as to possible events that might befall the characters in getting to the Orun II, getting aboard the Orun II, and especially, once they start exploring the Orun II. These all have a cost in Dark Points to trigger, which of course, the Game Master will earn whenever a player fails a roll for his character and decides that he has to succeed, so therefore rerolls. In fact, there are probably too many suggestions for a Game Master to use, so either her players are going to end up rerolling a lot or she can save the ideas as inspiration for later events. Physically. The Dying Ship is impressive. Like the core rules, it is done in full colour, with lots of good art. The latter is accompanied by full colour hand-outs, NPC illustrations, and the deckplans of the Orun II. The writing is also clear and the translation is well handled. If there are any issues to The Dying Ship, then they are twofold. First, there is quite a bit of backstory to the scenario and there is possibility that access to that backstory might end up in the hands of the player characters. What that backstory truly is and what happens after the adventure ends is not really detailed. Second, the adventure is short. It could be played in a session with a little pace—perhaps even as a convention scenario—so it does sort of feel as if it could have provided just a bit more play, or been given options to extend it a little. That said, the scenario does offer possible hooks for adventures after the events aboard the Orun II. 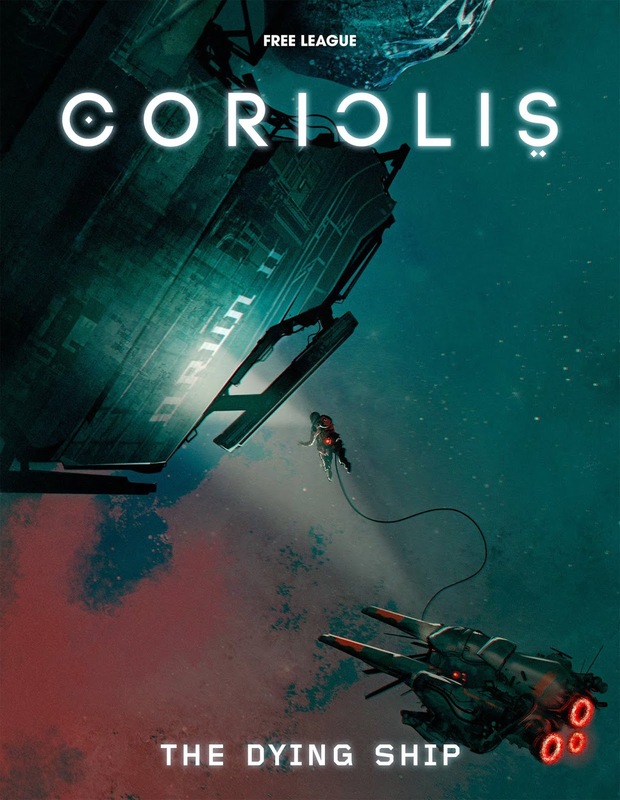 If the adventure in Coriolis: The Third Horizon presented the setting and the mechanics, then The Dying Ship presents a bigger adventure, a bigger stage, and the roleplaying game’s bigger themes. The Dying Ship is a good first adventure for Coriolis: The Third Horizon and hints, just a little, at some of its secrets and horrors.